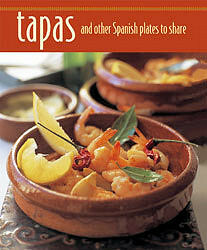 Another delightful book that I received recently was 'Tapas and Other Spanish Plates to Share'. 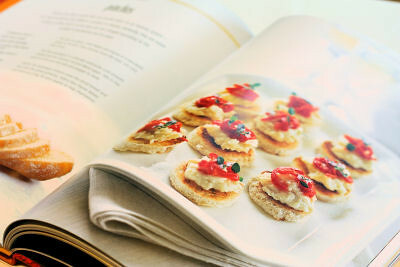 Gorgeous photos accompanying every recipe, this book is a must for tapas lovers. Traditional little Spanish nibbles, tapas have become extremely popular due to their variety and versatility. Not only can you serve them with pre-dinner drinks, they also make a great starter or lunch. In the book you will find recipes for all the classic Spanish tapas, including Patatas Bravas (potatoes in tomato sauce), Tortilla Española (Spanish omlette), Albóndigas (meatballs in tomato sauce) and Gambas Al Ajillo (garlic prawns). The chapters are divided into meat and poultry, fish and seafood, vegetables, and there is a great section with cheese and egg recipes. In fact, there is something for everyone and many of the recipes are straightforward and easy to make. Quite a few of the dishes can be prepared ahead of time, making entertaining more enjoyable. One of the recipes I chose to make was 'Queso Frito' (fried cheese). The cheese used in this recipe was Manchego cheese, which is made in the La Mancha region of Spain, from sheep's milk. It is a really firm cheese and pale ivory yellow in colour, making it perfect for cooking. Recipe by Linda Tubby from Tapas and Other Spanish Plates to Share, Ryland Peters & Small. 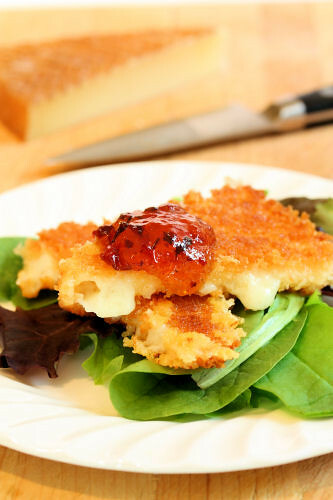 The recipe suggests serving the fried cheese with membrillo, which is a quince paste, but I used a smoked chilli jelly from Belazu, which complemented the cheese very well. Cut the rind off the Manchego cheese and cut it into 1cm wedges. Using three small plates or bowls, put the flour in one, the egg in another and the breadcrumbs in the last one. Dip the wedges of cheese into the flour, then the beaten egg, and lastly the breadcrumbs. Place on a plate while you heat the oil. Heat half of the olive oil in a non-stick frying pan over a medium heat. Fry the cheese wedges in a single layer in batches until crisp and golden - about 45 seconds to a minute on each side. Drain on kitchen paper. Wipe the pan out of any burnt breadcrumbs and fry the remaining wedges in the same way, using the rest of the olive oil. Sprinkle with the paprika and serve hot. The book can be bought directly from Ryland Peters & Small, or from Amazon. This content belongs to Nic at Cherrapeno. All writing and photography copyright N Fowers © 2007-2010 unless otherwise indicated. All rights reserved. 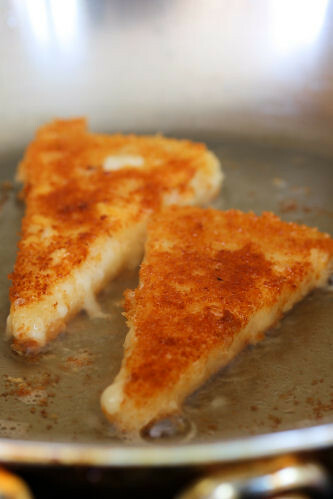 Fried cheese is so simple yet it's one of the tastiest! I've seen this cheese many times and have wanted to try it. I now have an excellent recipe to try. Thanks Nic. oh my god.... heavenly again! although i don't image it'll do much for my diet this week... oh heck, who am I kidding, where's the frying pan? I love hosting tapas parties. Fried cheese would surely be a hit. Looks great. I was salivating just at the words fried cheese, yet alone the mouthwatering pictures! Drool! I have a feeling I should make these when no one else is home and gorge myself silly! Though not a fan of fried cheese this look super yum! of all the things to fry, cheese is just one of the most awesome. that's all there is to it. yum. Manchego is most delicious, but I've never tried it fried. I'm sure I'd love it - it just sounds so decedent. Good lord, yes I love God, but oh my...fried cheese? Be still my heart. I think I could live off dairy and carbs. I need this book! 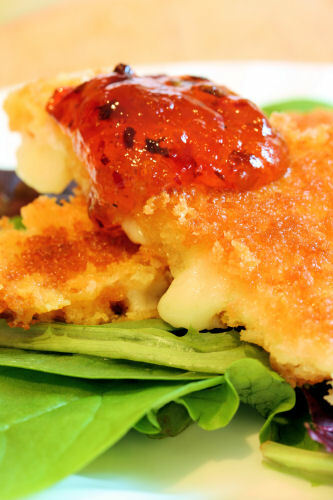 Love fried cheese and with the smoked chilli jelly = double yum! Love it, love it! I hope that you don't mind but I featured your recipe as an article of the week (just a thumb and link to your site). Margot - that is fine, thank you!